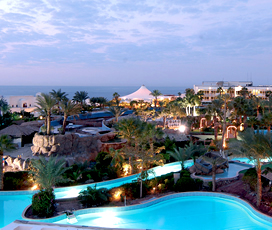 "Sharm El Sheikh is the most popular resort in Egypt. 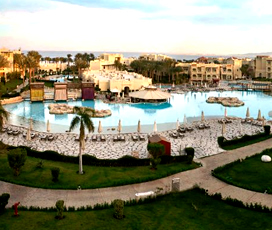 There is something for everyone, whether you wish to spend your days on the white sandy beaches or even go shopping!" 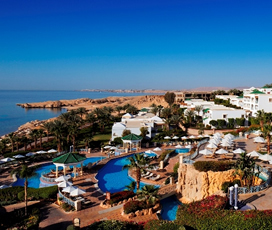 With 60 kilometres of white sand beaches, world-class resorts and the best diving sites, Sharm El Sheikh is known as the ‘Egyptian Riviera’. 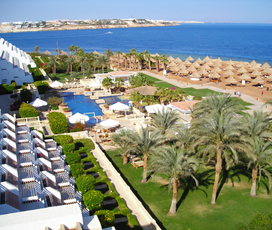 The resort is located on the Sinai Peninsula and currently is Egypt’s most popular holiday resort. 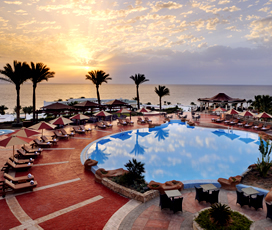 Sharm el-Sheikh is a purpose-built resort that specialises in gorgeous sandy beaches and amazing underwater scenery. It is ideal for anyone seeking a traditional beach holiday, offering family-friendly facilities and great options for couples too. It is a site of pilgrimage for scuba divers around the world, who come to experience the incredible colourful reefs that are submerged just beneath its surface. 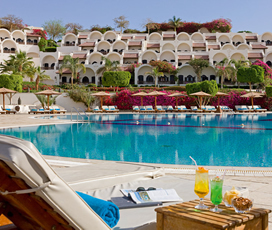 Sharm el-Sheikh is also incredibly modern, offering great restaurants, nightlife and shopping, making it ideal for anyone who wants to enjoy the magic of the Red Sea, under the hot Egyptian sun. 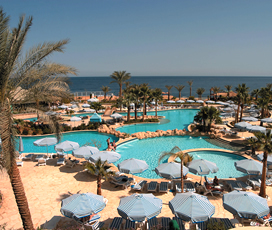 A world-famous Egyptian resort it is located between the Sinai Peninsula and the Red Sea. It is famous for its gorgeous sandy beaches and the sapphire blue waters of the Red Sea, which hide coral reefs and a plethora of incredible marine life. 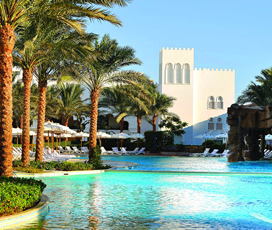 The place itself is packed with bars and restaurants making it ideal for a relaxing beach holiday, while the opportunity to visit the desert and soak up some ancient Bedouin culture, means that visitors to it can have the best of both worlds. 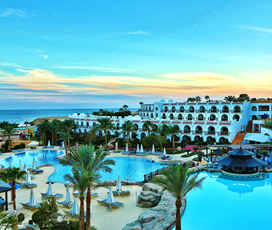 Sharm el Sheikh is famed for its hot all-year-round climate, with temperatures that never average below 18 degrees (January). 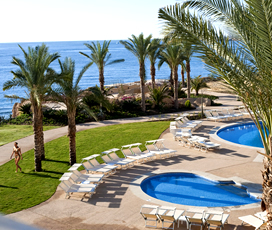 This makes it ideal for those who want to enjoy the gorgeous sandy beaches and sparkling waters of the Red Sea. 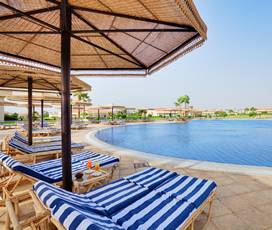 The best months to visit are June, July and August when temperatures average above 30 degrees and the sea temperature reaches as high as 29 degrees. 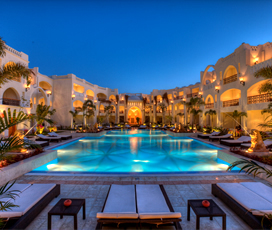 Although, the desert climate means that it is possible to swim throughout the year. 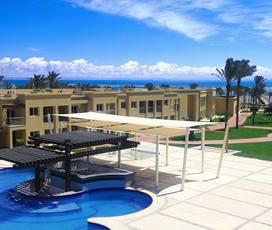 The resort’s location is at the southern tip of the Sinai Peninsula, which has always made it an important strategic location, as it guards the spot where the Red Sea, Gulf of Suez and Gulf of Aqaba meet. It is situated close to Jabal Musa (Mount Sinai), where Moses supposedly climbed up the mountain and received the 10 commandments, alongside St Catherine’s Monastery, which is widely believed to be the location of the burning bush. It was part of the Islamic dynasties after their conquest of Egypt in the 7th century and then fell to the Ottomans, until Britain took over control of the country. It then joined Egypt, before briefly falling under Israeli control after the war between the two countries and is now one of the most popular tourist destinations in the world, thanks to its incredible marine conditions. 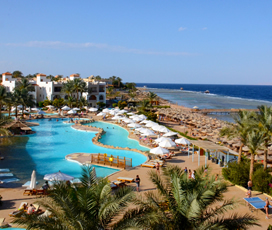 The best thing about Sharm El Sheikh is the magical waters of the Red Sea that surround it and there is a myriad of gorgeous golden beaches that are perfect for families who want to relax and soak up the sun on their family holiday. While there swimming is an absolute must, with the colourful reefs that lie beneath its surface great for snorkelling enthusiasts. There is also a variety of other watersports on offer ensuring aquatic fun for the entire family. 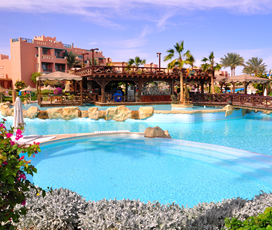 Other activities of note include: The Aqua Blue Waterpark and the various islands that can be accessed via boat. 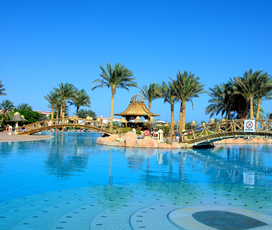 The turquoise waters of the Red Sea are the biggest attraction in Sharm El Sheikh and can be enjoyed in a variety of different ways, ranging from exciting watersports to relaxing on the beach. No trip to the area would be complete without seeing the many colourful coral reefs that lie submerged beneath the surface, which can be explored by either diving or snorkelling. Dolphina Park plays host to a large number of native dolphins and offers visitors the chance to swim with dolphins or simply watch them perform. There are also a large number of islands that lie just off the coast with boat companies providing daily trips to them. 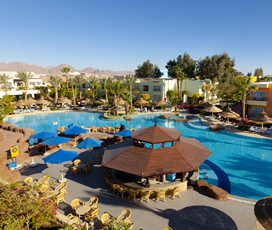 Naama Bay is the place to head for, if you want to shop in Sharm el Sheikh, it is fairly modern and not especially renowned for traditional Egyptian shops. Instead it provides a plethora of fashionable clothes stores, extravagant jewellery shops and food outlets. Al Khan and La Strada are two shopping malls that can be found in the Nabq area of town and offer a great range of shopping choices. Similar to many places in Egypt, it is often a good idea to haggle in shops as the stated price may be significantly above the actual price.